Adam Rowe is filming his second, brand new, hour long comedy special at The Epstein Theatre in Liverpool. This will NOT be the show he is currently touring around The UK, it will be a completely new show featuring his trademark, no holds barred, brutally honest stand-up - titled Undeniable. This show will debut at The 2018 Melbourne International Comedy Festival, in Australia, and then take a month long residency at The Edinburgh Fringe Festival, following his smash hit, totally sold out 2017 run of his show Unbearable. Undeniable is about how if you want things to happen, you just have to work hard until they do. 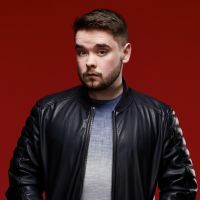 Adams had quite the year, after releasing his self-produced, debut one hour comedy special, then releasing small clips of his routines online, his social media fan base has grown which subsequently aided his debut, again self-produced, UK tour to totally sell out. So how has all this happened to a lad from Dovecot? What happened along the way as hes been travelling the world performing? Hell let you know all of this during this brand new, hilarious show. Book now to be a part of what will undoubtedly be the best night of his next tour. His hometown gig, at the gorgeous Epstein Theatre, with the cameras on will see Adam at his rampant, dismissive, rollicking, best.